Printing your Xmas card labels from NAV made easy by Dime.Label! Dime.Label is the software of choice if it comes to printing labels from NAV on a Dymo Labelwriter printer. 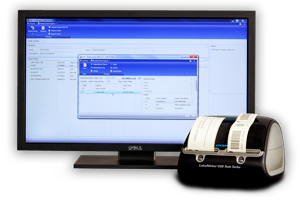 Until the end of 2014 we offer this easy to install and flexible label printing solution including a FREE Dymo Labelwriter TwinTurbo printer and FREE unlimited software assurance for only €985 (End-User price excl. VAT). Contact us to find a reseller in your region! Dime’s partner network in Germany has recently expanded. We are pleased to welcome TRASER Software GmbH as our newest reseller for Dime.Scheduler. TRASER Software GmbH – your software partner for agricultural- and construction-machine dealers. Their solution is specially developed for the needs of machine dealers, including the areas TRADE, SERVICE and RENTAL. Hauke Lamb explains : Dime.Scheduler is a perfect fit for our dealer management system and supports our customers to administrate their service orders and technicians.